My biggest fear about working with Ingrid’s yarn was that I was going to ruin it. That I was going to take something so, so precious to me, filled with so many memories and meaning, and knit it up into something seriously ugly. 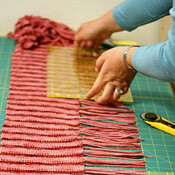 Especially if the process of knitting it up required chopping the yarn into a hundred little bits! Fortunately I ended up with circles upon circles of fringe, deep and textured and lovely! Yarn: lovely DK-weight wool, about 6 ounces, Dyed by Ingrid! Finished size: about 6.25″ wide, 86″ long, with 4″ fringe. 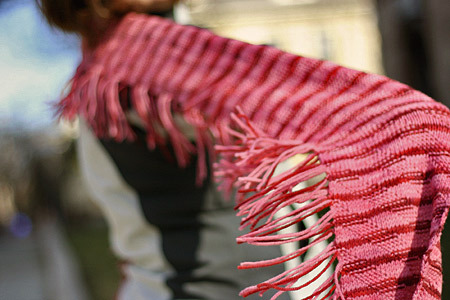 The scarf’s multitude of dimensions – the two colors, the variegations of red and pink, the knits against the purls, the diagonal lines, the fringe – that’s definitely my favorite part! I’m also glad that my limited and irreproducible supply of wool resulted in a pretty hefty scarf – I love wrapping the fabric round and round my neck, tossing it over my shoulder, looping it this way and that :). Making the fringe was (honestly) a little tedious: leaving the strands of yarn at the end of every row, pulling them taut, tying the knots, cutting the ends evenly. Well, the cutting part was pretty quick and fun, especially considering how much trouble I had the last time around! Anything is possible with a rotary cutter and cutting mat! …a perfect Valentine’s Day confection. I love your new scarf. But I have to admit that I seriously covet your rotary cutter! 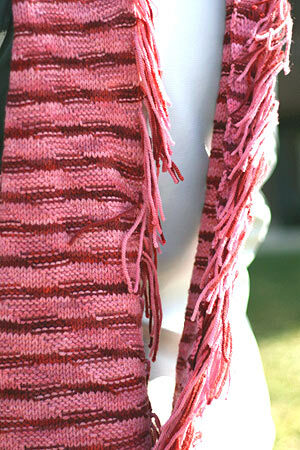 I love the little reverse purl color peeking out on the stripy rows! Seriously fun!! Great job with some yummy yarn. It’s quite lovely. I hate cutting yarn, also. I made a few pompons from handspun once and it was scary. It’s a beautiful scarf to remind you of your friend. Love the way you did the fringe! Big smiles here. I remember how envious we on the forum were about your trip. 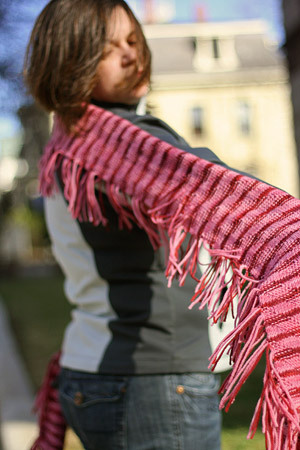 You made a lovely story about it before, and the scarf you’ve now made with your Precious Yarn (http://tinyurl.com/2vqa5y) is pretty and fun! That’s truly beautiful. You did the yarn proud. Gee, I have a rotary cutter and mat but never used it. I just finished a Graceful Shawl and need to trim the ends. I guess I’ll get out my supplies. I never thought of doing that with knitting. Beautiful. You really made the yarn stand out! I loved your cutting process, especially compared to last time. 🙂 I will have to keep a rotary cutter in mind for the next time I add fringe. love the scarf. 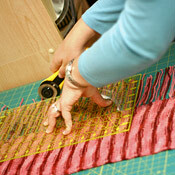 Great use of the rotary cutter which I own but have never used. Now I learned a new use for it. I hadn’t lived until I had a rotary cutter. I wonder how one might work for steeking??? What a perfect use of such a special yarn! I love red & pink together. it’s awesome…looks like the yarn was made for that scarf! That is definitely a lovely scarf! Very pretty! I’m glad it worked out so well for you. Great tip on fringe cutting. Very beatiful and a very good idea to use the cutter. The scarf is awesome! The yarn, beautiful! Is the rest of the book worth buying? I don’t remember this one. Thanks for the look inside. Love it! Love the pattern, the fringe, and, especially the colors. Love it! It looks great, Kathy. And what a great idea for getting the fringe all nice and even. I don’t do fringe much since I don’t like the work involved in making it even…and yet my rotary cutter and mat are still in their original packaging. What a waste! Thanks for the great idea! So pretty! Your fringe on this project inspired the lap shawl I made for my mom! Oh my…….that is one gorgeous scarf! Love the fringe! You have inspired me to knit something that I normally wouldn’t knit. I never even looked twice at this scarf until this! Absolutely stunning. That is so gorgeous! I have recently been converted to a scarf wearer. I love the fringe and that it runs the length of the scarf. It’s so unusual and pretty! I went back and read the story of the yarn and it was beautiful! and the scarf is the perfect happy ending. I have been a regular lurker on your blog for several months now and as a new knitter am inspired that you (who produce such amazing things!) only started to knit in 2004! I am blogless but you make my day! I think this may be one of my favorite finished objects I’ve seen you share with us. Lovely all around! 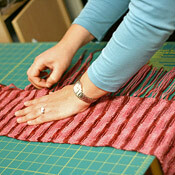 I love the combination of the pattern and yarn and the fringe on one side instead of top and bottom is intersting. Nice work. GORGEOUS! The colour and pattern (and fiddly fringe) work together SO beautifully! Love the way that turned out. What a great way to use up those odd balls hanging around in the stash. It’s so simple yet really interesting. Enjoy. Very dramatic! 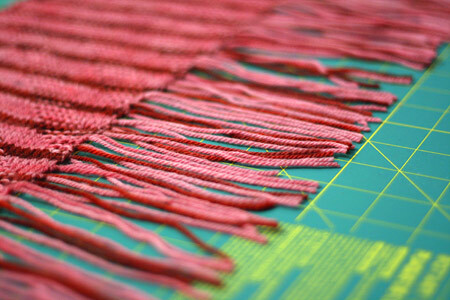 Great use of some very special yarn–and now it will actually be seen. Beautiful job! I love that first pic. So, how is the fringe made in the first place? You knit across a row and back, then cut the yarn, leave a new tail, and repeat? I have a failed granny-square-based FO, and I’m thinking the little pieces of yarn from frogging the granny squares might work well for this. 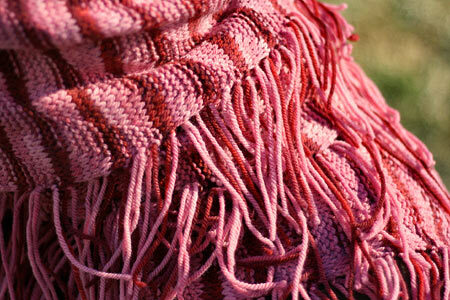 Gorgeous yarn and beautiful scarf! how gorgeous! I think it would drive me nuts to make it though… i absolutely love yours though! That is the most perfectess scarf! So wonderful for Valentine’s and beyond. Oh, it’s FANTASTIC! Great job!!! A lovely and special knit, for sure. Kathy, you are a brave brave woman to hack up that yummy yarn like that. But, your bravery was very well rewarded. I wish I had thought of that rotary cutter thing when I was combing out fringe on my carpet with a wide tooth comb and using many many index cards lined up and long scissors and many prayers. Your way looks so way easier. Nice job. Wow – love it. I’ve been waiting for the FO on this one, and it turned out even better than I thought it would. Might have to make one of my own. Wow! Love the scarf and the colors. What a lovely scarf! I do like the fringe, too; it’s an interesting twist on the normal fringes we see on scarves, being at the narrow edges rather than along one long edge. Does the fringe blow in your face, though, when it’s windy? I think that would drive me nuts! What a brilliant pattern and, of course, spot on execution! Hope all is well. W O W, this is looking amazing nice, wonderful!!! !